Earlier today I went to pick up my race packet at the Fitness Meets Fashion Market and Packet Pick Up for The Magnificent Mile Chicago Women's Half Marathon and 5k. It would have been kind of hard to miss this sign. It was easy to find and get to, being at the South Loop location of Fleet Feet Sports Chicago. I took the red line to the Roosevelt stop and then walked the short distance to the store. Although I wasn't happy with having to wait so long for information about packet pick up (they only emailed Thursday, with pick up starting on Friday), I have to hand to Fleet Feet, packet pick up went very quickly and smoothly, as everything was clearly labeled and they kept the lines moving. I really only had to wait in line for maybe 5 minutes. All you needed was your bib number email and/or an id. For anyone who didn't get the email or may have lost the email, they had stations set up where you could look up your bib number. There wasn't really anything to the packet, however. Inside I found my bib, 4 safety pins, the gear check bag, my shirt, and....nope, that's it. No freebies, no coupons, no course map or event information...just the absolute basics. I did pick up a Magnificent Mile Passport, but I don't think I'll be using it, as the discounts it offers are either not very good or for places that I'm not interested in going to. I found the "market" somewhat disappointing, too. Admittedly, I got there later than planned, so I wasn't able to participate in the shake out run or the complimentary yoga class. Even so, where was the live music? Where were the food trucks? Where were all the things that were promised? I'm sorry but a handful of tents does not a market make, and everything that was available was far too expensive and far too small (sorry, but just because I run doesn't mean that I wear a small or extra small). I don't know. Maybe I should have gone yesterday? Maybe they ran out of things because I waited until the second day of the event? The entire market. Sorry, but I wasn't impressed. Most importantly, I discovered that there have been many changes to the race. I've been beating myself up about having to downgrade to the 5k, so I haven't been paying attention to the event itself. 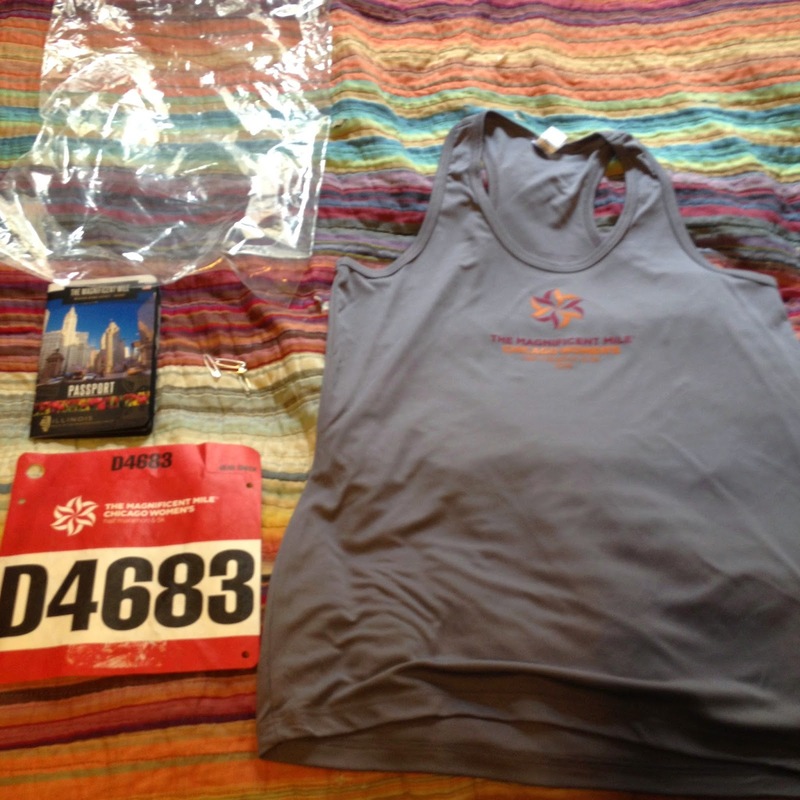 It turns out that the course for the half marathon has changed (now on the lake front trail instead of through closed city streets) and the shirt has changed (a much simpler and much cheaper tank that probably won't last through one wash instead of the high quality shirt that was promised), and this leaves me a bit worried for the event itself. I'm trying to stay positive. I'm hoping for the best tomorrow morning. I'll let you know how it goes.